Integra has participated in various industry studies for Cu wire evaluation using different flows and inspection methodologies. 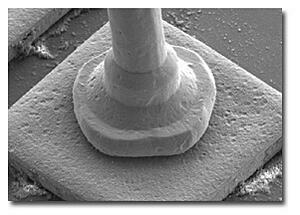 Integra offers a unique room ambient decapsulation process to minimize over-etching damage. The process includes the capability to etch and maintain complete integrity down to the ball attachment. Once the ball attachment is analyzed our process is capable of removing the ball attachment from the pad without destroying the metalized pad. Evaluation process flow includes control sample verification before actual sample decapsulation. Bond pull: MIL-STD-883, M2011 for Microcircuits and Hybrids and M2037 for Discrete semiconductors. Comprehensive reports with detailed photographs and data analysis are always provided.